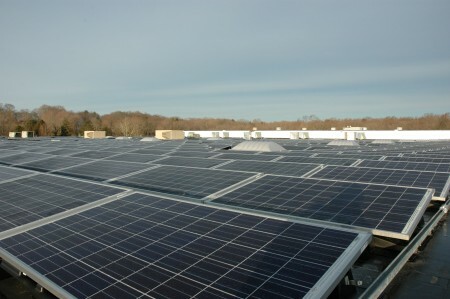 The Safety Zone’s new Guilford, Connecticut corporate headquarters is powered almost entirely by sunlight! In December of 2012, our friends at Independence Solar and Munger Construction installed a photovoltaic system on the roof of our facility. The American made panels supply 250kw of power at peak sunlight, enough to power the building and return about 65% of the generation to the grid. Even on overcast days our system is generating enough energy to break even on our usage. Our electric meter runs backwards when we’re supplying the grid, and forwards in the evenings when the sun sets. Taking an entire year into account, the solar system supplies most of the energy we use in the facility day or night. Solar is not the only clean energy investment we’ve made. Our new facility also has electric vehicle charging that is available free of charge to our employees to help power their commutes. We are very proud of our clean energy investments and look forward to finding more ways we can help reduce our environmental impact.